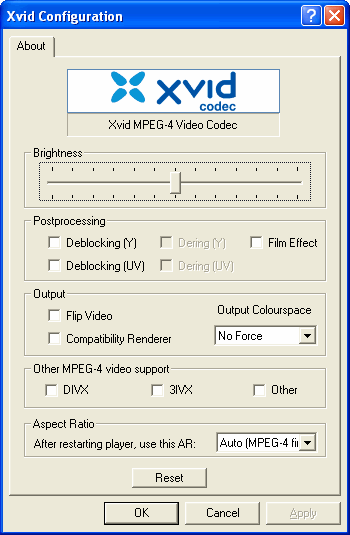 The Xvid Codec (formerly capitalized differently: XviD) is a video encoding and decoding (playback) codec designed to compete with the popular DivX codec. Who developed the Xvid codec? Xvid is a continuation of Project Mayo (original open source project responsible for the commercial DivX codec) and aims to develope a high quality open-source MPEG-4 codec. Unlike DivX, Xvid remains open-source. Why should I use the Xvid codec? Most encoding software that supports DivX encoding will also support Xvid encoding. The same goes for multimedia players, and standalone players. How do I encode video using the Xvid codec? You can read my DVD to Xvid Conversion Guide to find out how to convert DVDs to Xvid or if you are already familiar with DVD to DivX conversion, you can go directly to our Xvid Setup/Reference Guide. There are additional articles links on the Xvid Codec links page. Description: Tells you what the settings for the Xvid codec means, and which one you should enable or disable, and how to do 2-pass encoding with it. - Fix: Produce debug output only when debug option is enabled. - Deactivate MFT filter in Win 8.0+. Since Microsoft blocks third-party MFTs in UWP apps, it causes issues making our MFT the default.